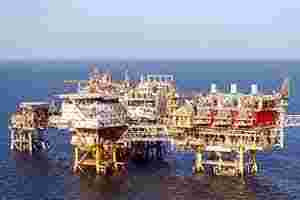 Mumbai: State-owned Oil and Natural Gas Corp (ONGC) Tuesday surged nearly 4% in morning trade on bourses after it reported 60% jump in net profit in the second quarter ended September. ONGC announced the results on 4 November, after market hours. Stock markets had remained closed on 7 November, on account of Bakri-id. Similar movement was witnessed on the National Stock Exchange (NSE) as well, where the stock after opening at ₹ 286, jumped 4.06% over its previous closing price to a high of ₹ 288.05. Net profit in the July-September quarter of ONGC stood at ₹ 8,642 crore as against ₹ 5,389 crore in the year-ago period. “The increase was mainly due to higher price realization and lower fuel subsidy payout," ONGC chairman and managing director (MD) Sudhir Vasudeva had said commenting on the results on Friday. Shares of the company, however, pared some initial gains and were trading at ₹ 280.60, up 1.06% on the BSE and at ₹ 280.20, higher by 1.23% on the NSE at 11:20 am. ONGC got $116.94 for every barrel of crude oil produced in the second quarter as against $79.21 per barrel in the same period a year ago. After paying fuel subsidy, its net realization was $83.70 per barrel against $62.75 a barrel in second quarter of last fiscal.